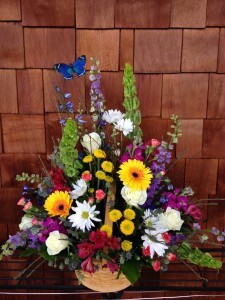 All of our arrangements are custom designed for You! We have a wide variety of glass, metal, pottery and basket containers in different shapes, sizes and colors. Call and let us know what size, color and type is best for you. Our long stem roses are arranged in a traditional garden vase with greens and fillers. For that contemporary look, we have cylinder vases in different sizes. We usually stock three colors of roses, but can get other colors in a days notice. A dozen roses start at $65 and half dozen at $35 (Excluding Valentine’s Day and Mother’s Day – Market Pricing – Usually a little higher). Our best seller is the traditional garden vase arrangement. 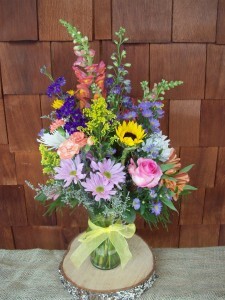 Seasonal flowers are available in a variety of shapes, sizes and colors. The Contemporary look is about shape, design and color. 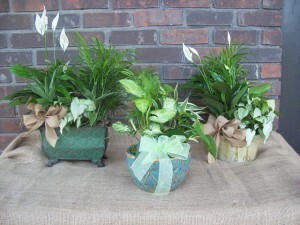 Most popular are the cube or bubble bowl containers that offer a low, lush look. These arrangements have the same amount of flowers as a traditional vase arrangement, but minus the stems. 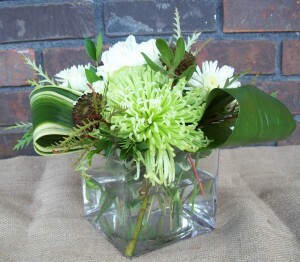 Cube or bubble bowl containers are great for offices, coffee tables and hospital rooms. 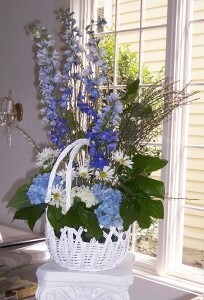 A Basket Arrangement is great for nursing homes, hospitals and condolences. 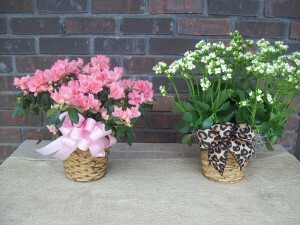 We have a wide variety of sizes, shapes and colors of baskets for that right arrangement. Our staff is very knowledgeable and with Horticultural backgrounds, can assist you with your selection. We carry a selection of dish gardens, euro gardens, tropical plants and seasonal blooming indoor or outdoor plants. Dish Gardens are a mix of different plants in one container, such as a ceramic pot, metal container or a basket, sharing the same soil. 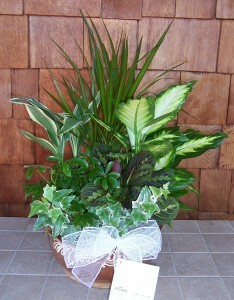 Euro Gardens are a mix of individual potted plants in a large basket. Either one of these gardens are popular for housewarmings, get well and sympathy gifts. 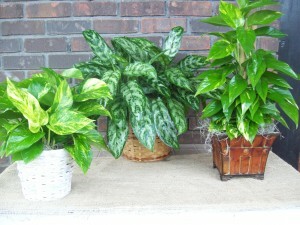 House Plants are available, either in tabletop or floor sizes and come in a basket or decorative container. 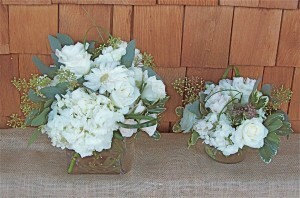 Fresh cut and tubed flowers can be added for color at an extra cost. Blooming Plants may be seasonal, please check with us for availability.